Powered by the Satellite Receiver (or user supplied power source). Power Source The SatAlign 2 is powered by the Satellite Receiver. 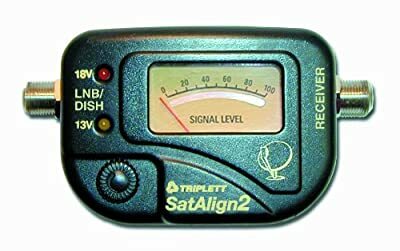 There is also a power jack located under the "RECEIVER" terminal which can be used to power the SatAlign 2 with a user supplied external source. If the power level is less than 15V +/-0.5V, the 13V LED will light. If the power level is more than 15V +/-0.5V, the 18V LED will light. The satalign 2 includes audible tone to help you "zero in" on the satellite. A quick, economical, do-it-yourself way to install or realign your satellite dish. The Triplett SatAlign is a quick and economical way for the do-it-yourselfer to. install or realign a DBS satellite dish. No need to pay for expensive service call Just connect the SatAlign between the LNB and any DBS Satellite Receiver and you can precisely align your dish in seconds. The SatAlign, with its built-in signal strength meter, is extremely sensitive with a quick response time making satellite alignment a breeze. The SatAlign works with all brands of Dish Antennas and Satellite Receivers. It will save you hours of installation time and guarantees exact alignment for the best picture quality and maximum rainfade reserve. Specifications: frequency range: 950MHz to 2050MHz. Impedance: 75 Ohms. Maximum input level: -10 dBm. Detection range: -40 to -10 dBm. Insertion loss: 4 dB. Indicators: analog panel meter. Variable pitch tone. Power / polarization LED's. Connectors: LNB / Dish, F Connector. Receiver, F Connector. Dimensions: 1.5" x 2.1" x 3.8". Weight: 3 oz.